Disney’s latest live-action-adventure film, Dumbo follows the story of the beloved flying baby elephant. Directed by Tim Burton, the film is an adaptation of the 1941 animated classic of the same name. The film first introduces Max Medici (Danny DeVito) as the owner of the struggling Medici Brothers Circus and Holt Farrier (Colin Farrell), as a former circus star. Medici enlists Holt and his children, Milly (Nico Parker), and Joe (Finley Hobbins), to care for Dumbo, a newborn elephant with oversized ears. 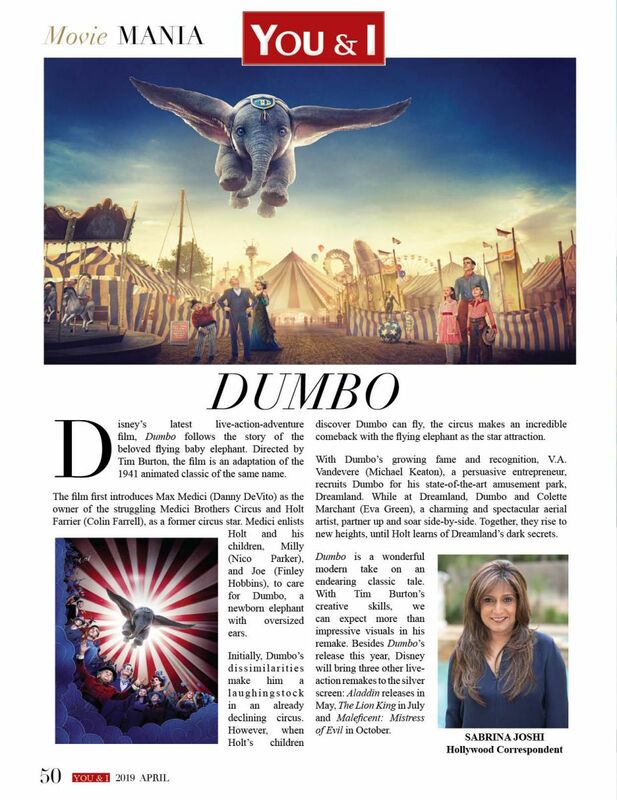 Initially, Dumbo’s dissimilarities make him a laughingstock in an already declining circus. However, when Holt’s children discover Dumbo can fly, the circus makes an incredible comeback with the flying elephant as the star attraction. With Dumbo’s growing fame and recognition, V.A. Vandevere (Michael Keaton), a persuasive entrepreneur, recruits Dumbo for his state-of-the-art amusement park, Dreamland. While at Dreamland, Dumbo and Colette Marchant (Eva Green), a charming and spectacular aerial artist, partner up and soar side-by-side. Together, they rise to new heights, until Holt learns of Dreamland’s dark secrets. Dumbo is a wonderful modern take on an endearing classic tale. With Tim Burton’s creative skills, we can expect more than impressive visuals in his remake. Besides Dumbo’s release this year, Disney will bring three other live-action remakes to the silver screen: Aladdin releases in May, The Lion King in July and Maleficent: Mistress of Evil in October.